I'm not really that fond of Vietnamese cooking nor steamed egg dishes in the past. 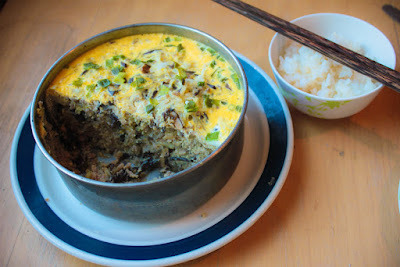 This dish called the Vietnamese egg meat loaf tickled my taste buds. It's eaten with some rice and Vietnamese soy sauce. I never expected to like this dish considering I wasn't so fond of Chinese steamed egg dishes when I was younger. It's prepared by mixing eggs and ground pork, steaming it in medium heat for half an hour and then adding some yolks on top then steaming it for a quarter hour to make a dish. Added into the meat are cloud ear fungus and some mushrooms which contributes to the flavor. Soy sauce, oyster sauce and some sugar are added as seasonings to enhance the flavor.